Mary Ellena Coviello, 79, passed away on Sunday, March 24, 2019 at her home. Born in Malden, MA, she had been a Peninsula resident since 1971. She worked as a cashier for the U.S Government in the Finance Dept. at Ft. Monroe and Ft. Eustis. 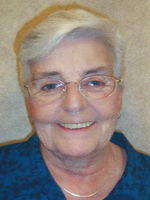 She was a dedicated member of St. Jerome Catholic Church. Mary was preceded in death by her husband, Robert Coviello and her sister, Anne McCann. She is survived by her daughters, Mary Coviello-Hassell and her husband, David of Gloucester, VA, Paula Bamburg and her husband, Jay of Newport News, and Roberta Reinbach and her husband, Chris of Newport News; her son, Christopher Coviello and his wife, April of Vanceboro, NC; her sister, Paula Mombourquette; her brother, William Finnerty; 11 grandchildren and 6 great-grandchildren. A Memorial Mass will be held at 10:00a.m. on Saturday, April 6, 2019 by Rev. Patrick Baffour-Akoto at St. Jerome Catholic Church, with a reception to follow at the church. Final interment will be held at a later date. Flowers are welcome or contributions may be sent to the American Cancer Society. Arrangements by Weymouth Funeral Home.